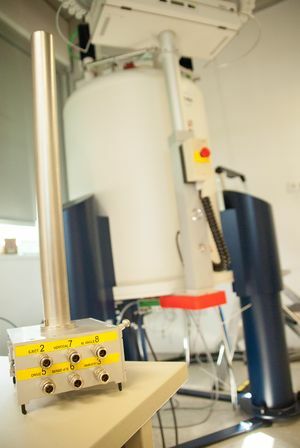 The Radboud University Nijmegen (RUN) has the most extensive NMR and MR research equipment in the Netherlands, located in the academic hospital, the science faculty and associated institutes. For biomedical applications the following NMR and MR systems are available for imaging and spectroscopy. For clinical MR research two human 3T and three human 1.5 T whole body MR systems are available at the Radiology department of the Radboudumc. Since 2010, a human 7T whole body MR has become operational within the Erwin Hahn institute (collaboration of the Radboud University Nijmegen and University of Essen). A broad range of RF probes for various nuclei is available. Several setups are home built. 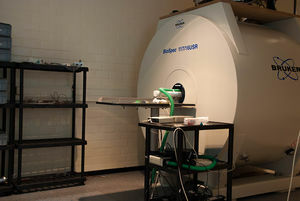 The department’s animal MR-facility is housed in the PRIME (Preclinical Imaging Centre) of the Radboudumc. 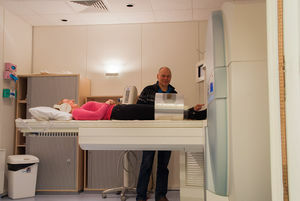 A horizontal bore 7T MR system (Clinscan) and a horizontal bore 11.7T MR system (Biospec) are available. The systems are optimized for studies of small animals (e.g. mice and rats). A broad range of dedicated RF probes and animal monitoring devices are available. An earth field system is also available. This MR facility contains an RF lab for in-house hardware development. The MR equipment is installed in the animal imaging centre (PRIME) together with a PET/CT, SPECT and optical imaging devices. Small and wide bore NMR machines up to 20 T (and higher) are available at the Goudsmit pavilion of the Radboud University (RU) Nijmegen. One system at 11.7T is equipped with a HRMAS probe and an automatic sample changer is available. Tissue samples and cell extractions are measured at several nuclei. Dissolution DNP is a relative new technique in which 13C labeled molecules are hyperpolarized in solid state at 1.2 K. After rapid heating to room temperature, the molecules can be injected into a biological system, (e.g. cell suspension). This leads to signal enhancements up to 10,000 times the normal signal and allows the metabolic conversion of the polarized molecules to be followed by MR in real time in vivo.